My wife is American, and we live in Canada. As such, we have the option of two thanksgivings to celebrate. To make things more interesting, his birthday falls around the American thanksgiving. Since we are in Canada, we have to celebrate the Canadian thanksgiving. That being said, we decided to have a little fun for his birthday and make Turducken. 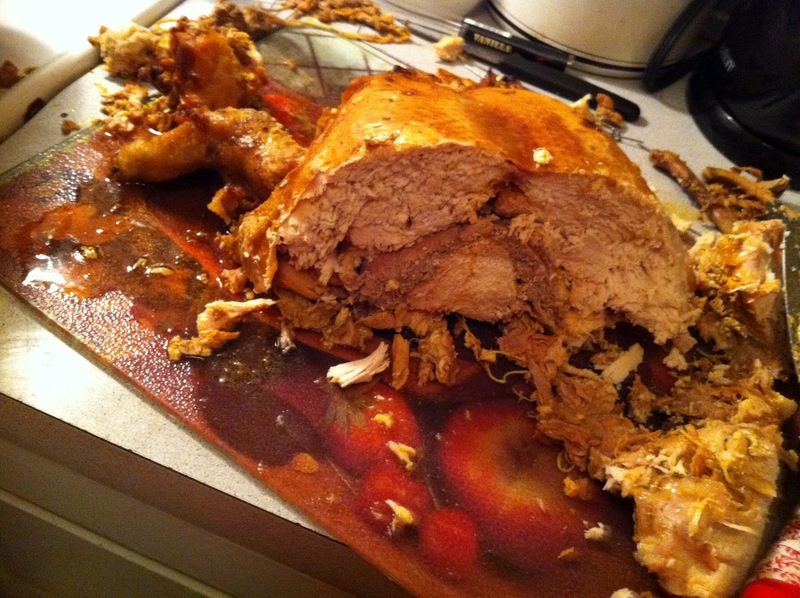 For those of you who don't know, a turducken is a chicken stuffed in a duck and stuffed in a turkey. My wife often follows up with the joke that the ultimate challenge is the dish that starts with a hummingbird and ends with a cow. Still turducken is enough of a challenge to start. All three birds need to be completely deboned, although the turkey legs and wings can have their bones. I am lucky and I have a great place to get birds. Saslov's meat market in the Byward market.They were nice enough to do the deboning for me, so that when I had half the work to do. I decided to brine all three birds. This ended up being a great idea. One of the biggest risks with turducken is making sure that all three birds are safely cooked all the way through. This could lead to the birds being dry. That being said, I also decided not to put stuffing in between the layers. Instead I filled it with seasonings. Then came problem number 2. I needed to close each bird, but the end result has to be able to be sliced. If I sowed them closed then I wouldn't be able to slice. I used some metal skewers and then used some string to tie the skewers and provide a means of pulling them out.Once everything was ready and set, I started baking. That is when the success of the brining really showed. There was soo much gravy that about half way through the cooking process, I had to pour off the gravy. Why? There was so much gravy that the whole thing was covered! I wasn't going to have roasted turducken, I was going to have boiled poultry! I poured out the liquid and made a lot of gravy. By the end of the roasting, I had half of a pan again of gravy. It was incredible! The turducken was a hit. It was a fun recipe to make and one I would make again. Not an easy thing to slice for the first time.